The semedori gains one point. White has 5 ko threats which should be enough to win the last ko. Result: B+3.5 -> that is the semedori at gains one point. Bill: I believe that this is orthodox play. is an ambiguous move, gaining 1 point, and is a 1 point reverse sente. is a 2/3 point sente, and is a 1/3 point gote, leaving and miai. 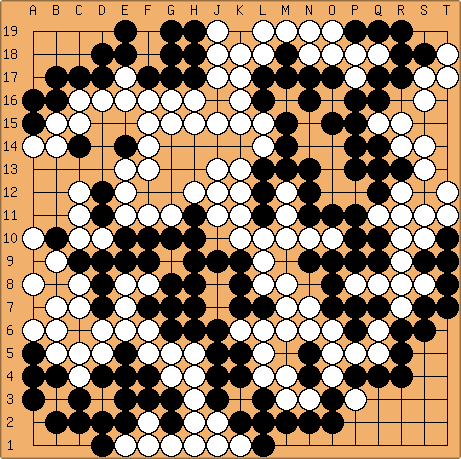 The score is the same as above, but White does not have to win a ko fight. tapir: Thank you. So it boils down to play the 1 point sente/ambiguous/gote? instead of the 0 point sente (in the game). I thought this may be a good semedori example, but it seems that it isn't. What is the result with at ? What next - a b or c? Now white captures the ko in sente. And then proceeds to play x. 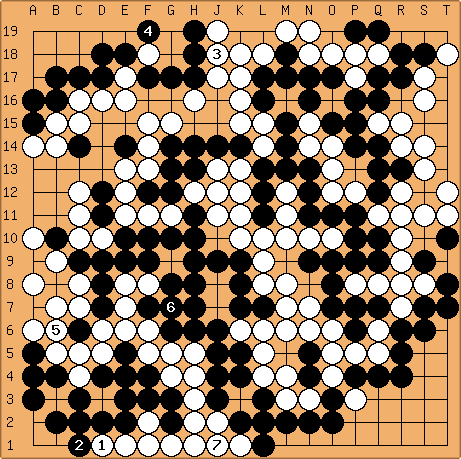 However the mistake may be white invested two points here, so has to win the ko to arrive at the same score. Correct?